A parliamentary report of 1777 recorded a parish workhouse in operation at Swaffham for up to 50 inmates. County of Norfolk: Ashill (2), Beechamwell, Bodney, East Bradenham, West Bradenham, Buckenham Tofts, Caldecote, Cockley Cley, Colveston, Great Cressingham, Little Cressingham (2), Didlington, Foulden (2), Gooderstone (2), Hilborough, Houghton-on-the-Hill, Holme Hale (2), Ickburgh, Langford, Narburgh [Narborough], Narford, Necton (3), Newton by Castle Acre, Oxborough, North Pickenham, South Pickenham, Saham Toney (3), Shingham, South Acre, Sporle with Palgrave (2), Stanford, Swaffham (4), Threxton. The population falling within the Union at the 1831 census had been 12,632 — with parishes ranging in size from Threxton (population 29) to Swaffham itself (3,285). The average annual poor-rate expenditure for the period 1833-35 had been £12,545 or 19s.10d. per head of the population. A new Swaffham Union workhouse was erected in 1836 at a site to the south of Swaffham. It cost £7,125 and could accommodate up to 405 inmates. 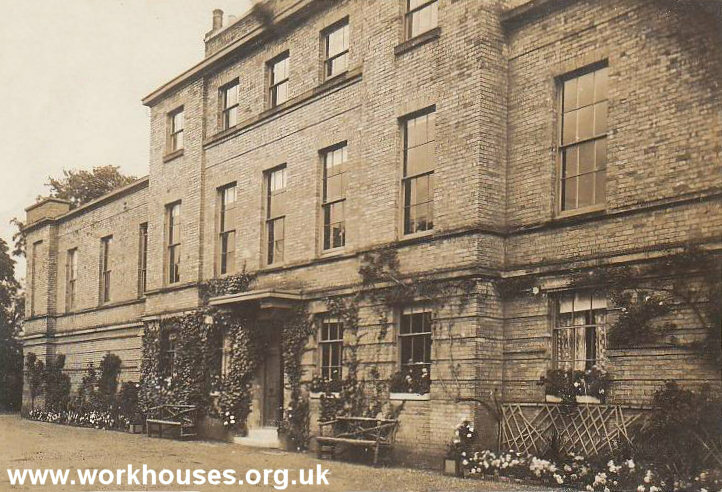 The building was designed by William J Donthorn who was also the architect of workhouses for the Downham, Erpingham, Freebridge Lynn, and Aylsham Unions. His design for Swaffham was closely based on Sampson Kempthorne's model hexagonal plan published by the Poor Law Commissioners in 1835. It had a entrance range at the west which contained the porter's lodge, board-room, offices and so on. To the rear, radiating from the central supervisory hub, were three accommodation wings for the various classes of inmate (male/female, old/able-bodied etc.). The areas between the wings were divided in segregated exercise yards. Service and workshop buildings formed the hexagonal perimeter of the workhouse. The site location and layout are shown on the 1905 map below. In 1894, the British Medical Journal set up a "commission" to investigate conditions in provincial workhouses and their infirmaries. Following a visit to Swaffham, the commission's report made a number of criticisms about the care provided for sick inmates: the accommodation for male and female patients, imbeciles and idiots, and the labour ward were scattered around the workhouse site; the sole nurse also acted as assistant to the matron and caretaker of the children; most of the hands-on nursing care was, in fact, performed by pauper inmates of the workhouse. The report recommended that the sick all be housed under one roof, with the labour ward placed in the same part of the building. It was suggested that an additional nurse be engaged when the nature of the cases under treatment requires it, and that paupers be used purely for household duties. Various improvements to the sanitary and bathing facilities were also required. Further details are available in the full report. Swaffham workhouse sale — Eastern Daily Press, 14th April 1926). Norfolk Record Office, The Archive Centre, Martineau Lane, Norwich NR1 2DQ. Holdings include: Guardians' minute books (1835-1930); Ledgers (1835-1930, missing 1893-4); Creed registers (1896-1902, 1906-19).